ZAMBIA’S sensational runner Kabange Mupopo yesterday put up a spectacular race to qualify to the 400 metres women semi-finals at the 2016 Rio Olympic Games in Brazil. Mupopo, who was in heat seven, lane seven, finished second, clocking 51.76 seconds behind Jamaican Shericka Jackson who timed 51.73s. She was second from start to finish, increasing her pace in the last 50 metres to secure her qualification. Mupopo beat six other runners with the closest rival Swiety Justyna from Poland clocking 51.82s. Mupopo however fell short of her personal best time of 50.22s which she set at the 2015 All Africa Games. The African champion will however face tough competition from Sahunae Miller of Bahamas and Allyson Felix of United States in the semi-finals tomorrow. Miller clocked 51.16s and Felix 51.24s respectively in the qualifying heats. Meanwhile, Gerald Phiri was the fifth Zambian athletes to exit the Olympics after finishing fourth in the 100 metres preliminary round with a time of 10.27s. Phiri was in heat two alongside winner Justin Gatlin of the United States who clocked 10.01s ahead of Daniel Bailey of Antigua and Barbados who timed 10.20s. Zambia Amateur Athletics Association (ZAAA) president Elias Mpondela hailed Mupopo for storming the semi-finals. Mpondela said Mupopo was a surprise package at the Olympics and can reach the finals. “I am happy with Mupopo’s performance. It is not surprising that she qualified. Mupopo is a hard working athlete and determined to reach greater heights. But it is unfortunate that Phiri failed to qualify for the semis. 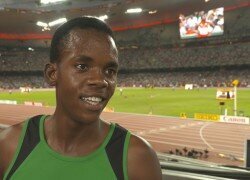 He put up a good run but faced tough runners like Gatlin,” he said.